The Fiji Independent Commission against Corruption is expected to conduct further interviews with SODELPA Leader Sitiveni Rabuka this week. This has been confirmed by Rabuka adding the FICAC requested him today to return to Suva for further interview. He was in Vanua Levu earlier this week to conduct campaign visits in Macuata and Bua over the next ten days, however, this has been cancelled. Rabuka is making his way back to Suva. He’s expected to resume his visit after FICAC is done with the latest round of interview. Meanwhile, FICAC says it will not make any comment on this matter at this time. 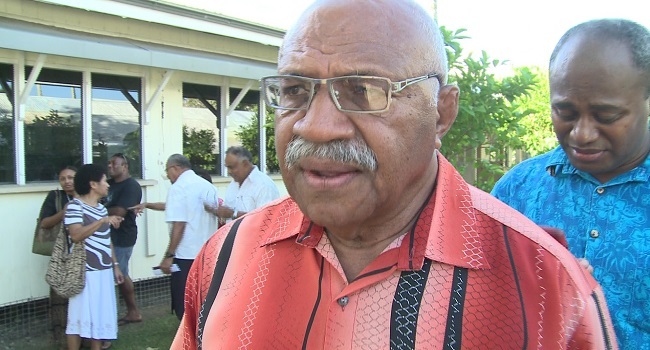 Rabuka is charged by FICAC under Section 24 of the Political Parties Registration, Conduct, Funding and Disclosures Act of 2013. Its alleged last year Rabuka provided false declaration of assets and liabilities to the Supervisor of Elections by failing to provide information pertaining to the tax liability with the Fiji Revenueвыручка, но не путать с прибылью and Customs Services which amounted to over $316,000.